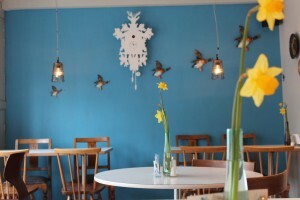 Our vision is to provide a relaxed meeting place where people can enjoy great food and refreshment throughout the day. We are a family owned and run business. One thing we can guarantee is that we make all our food with love and care…..we have many years years of working knowledge and aim for customers to feel leaving satisfied both in terms of the quality, value for money and providing informal friendly service. Open late morning for our great freshly roasted coffee,teas and other beverages. Open for lunch and dinner between Wednesday and Saturday where we offer one menu where you can have a choice of one, two or three courses. We love to seek the best of what local producers have to offer; focusing on seasonality wherever possible, basing our ideas on British cookery, the Mediterranean and a little bit of anything else that inspires us. Daily specials are available at lunchtime. We don’t consider, advertise or perceive to be fine dining. We just like to think we create vibrant, mouth-watering dishes – cooked and served by one family in our small cosy restaurant. In a hurry and just passing ? then we may be able to offer something to take- out including soups with some of our lovely bread, savoury tart and salad or may be a sticky toffee pudding for a sugar boost…. We are licensed – offering a selection of local bottled beers ,cider and craft lagers; as well as serving a list of almost sixty affordable and interesting wines. Children most welcome. We don’t have a children’s menu as such but will conjure up some equally tasty food and offer smaller portions from the daily menu. We have a selection of books to suit all ages…..
We’re here to please – so we’ll try our best if you require any special dietary requirements – just let us know!